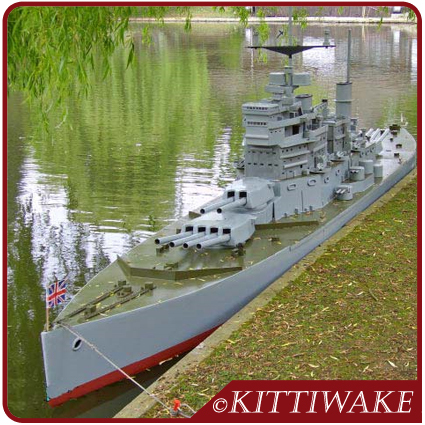 The first model built was the Battleship 'Ki ng George V', built in 1995. In order to fit two people sitting comfortably inside, it was decided that the dimensions would have to be 24' x 3'. This could then be broken down into 8' sections and bolted together, the 8' sections being the size of a standard sheet of plywood. It also meant that all the main superstructure and accomodation for the two crew, could fit in the centre section, with the fore and aft sections merely for deck and guns. The other important detail was to make sure the superstructure, which is fairly fragile, was kept secure during transportation. This was achieved by having an upper and lower section, which could be hinged, and also seperated. The upper section could be lifted off, inverted and then dropped down inside the lower section. All the small guns, masts and removable superstructure are stowed on racks inside the lower section. The big guns mounted on the fore and aft decks can also be stowed inside these sections, then all three sections can be racked up on a small trailer. The propulsion for this model is a small electric 2hp motor which is situated in a well just under the aft turret. The controls are situated beside the pilot, giving 4 forward speeds and 2 reverse. The steering control, in the form of a small steering wheel, is mounted on the other side of the pilot, and connected to the motor, which can then rotate giving superb manoevering capabilities. Stability is paramount as the crew are enclosed, but this model is incredibly stable, and will even support a 15st man standing on the edge of the deck. In the unlikely event of a capsize, the upper superstructure can be simply pushed off. Once seated inside the roomy cockpit, the lid can be lowered , and the pilot's head fits easily into the upper superstructure allowing good all round visibility.The all up weight of this model is approx 70kgs. Hire Roger and his fleet for £300 per model per day. Discounts for multiple days and/or models.